True, but one still has to take into account atmospheric radiation shielding ... I've lived at altitude in Denver and other locations even higher. I spent about a year at 9,000 feet above sea level. You sunburn faster in the mountains. 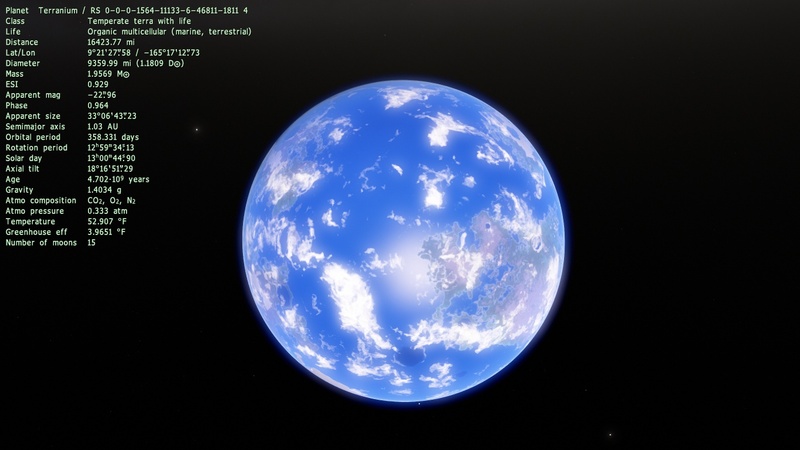 I found planet that looks a lot like Earth...! 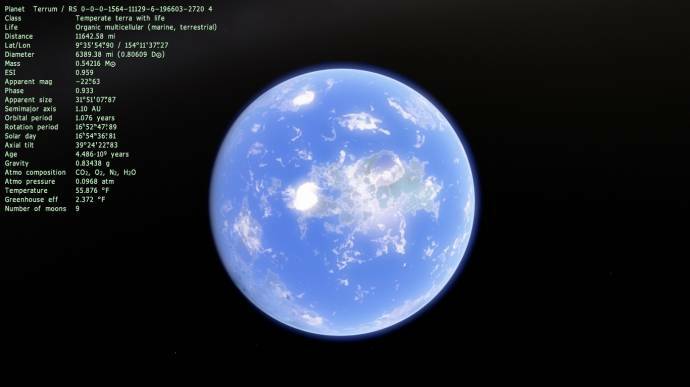 Looking for earth like planets in 0.972 is alot harder. Like really hard. And by that I mean the ones like yours. And wrote the coordinates to find the planets. Until now i have found around 52 planets or moons. 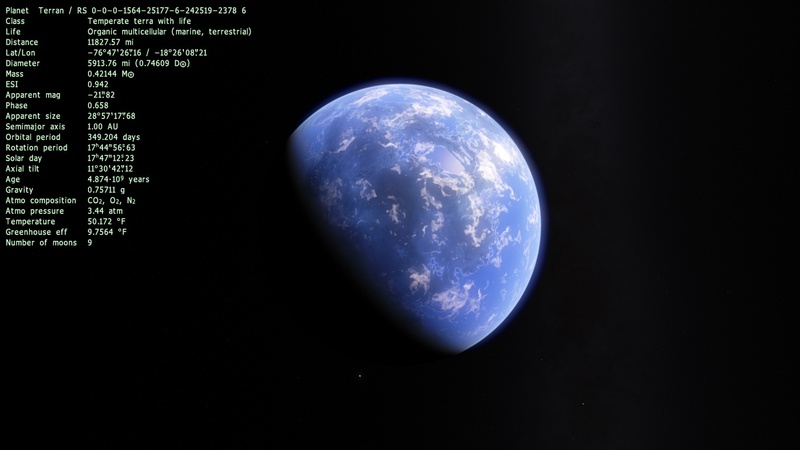 Because Kantallo's Star is a G7V star; it's lifespan shouldn't be as much of a problem as it would be on, say, Kepler 452b. 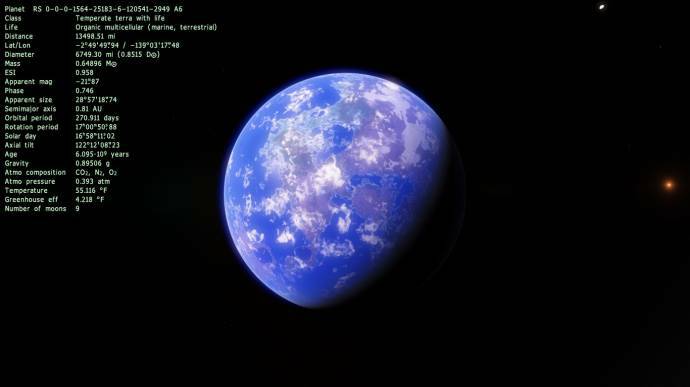 In case you're wondering, Xerotas is a pinkworld terra. I like it. Xerotas is less Earth-like than Islutas, but I would still rate it very favorably in terms of habitability. There is no particular aspect of it that concerns me too much, and it has a lot of strong points across the board, particularly its mass, density, surface pressure, landmass coverage, and rotation period. Of its potential weaknesses, I'd cite the 1/3 stronger surface gravity, and if we care of speculation of the atmospheric composition then I'm not sure what to make of its low molar mass (though it's higher than Islutas'). Hey, Gravity may be punishing, but maybe we can get over it... heh... besides, I have images of gas tubes so we can decide air composition I assume mainly nitrogen and oxygen because of the low molar masses, but here they are! definitely N2, and I hope there is oxygen, assuming that o2 is pale, maybe the thicker atmosphere makes up for it, and we could live there! The atmosphere of Xerotas cannot be mostly N2 and O2, since those have molar masses of 28g/mol and 32g/mol respectively. Remember it all has to average out to 17.44g/mol. Actually... unfortunately... that kind of ruins the notion of this having an atmosphere breathable to humans. The problem is that the only common atmospheric gases with molar masses less than 17.44g/mol are diatomic hydrogen (2g/mol), helium (4g/mol), and methane (16g/mol). This means that the highest possible concentration of N2 this atmosphere could have is 59.3%, with the other 40.7% being hydrogen. (I'm using the equations I describe here to do these calculations.) Adding oxygen to the mix will only reduce the amount of nitrogen there can be, and increase the amount of hydrogen there would have to be. E.g. an atmosphere with 20% oxygen could only have a maximum of 36% N2, with the remaining 44% being H2. That doesn't sound too bad. However, these are implausible atmospheres, since the planet is not massive enough to retain significant hydrogen or helium over billions of years. So the only gas that could realistically balance out the molar mass equation is methane. This dramatically reduces the possibilities. For instance, it means there cannot be more than 6.7% oxygen (with the rest being methane). "Heavy" gases like CO2, Ar, etc must also be in only small concentrations. 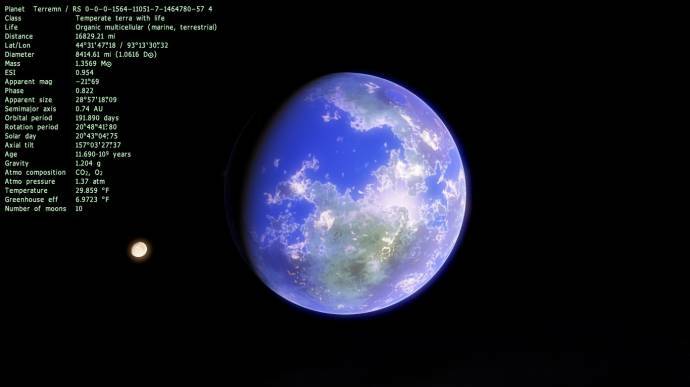 I think the most plausible atmosphere for this planet would be a "steam" atmosphere of mostly water vapor (18.02g/mol), balanced by methane, and maybe some nitrogen or other stuff in small amounts. Which is pretty interesting! My mind thinks of the Avatar world Pandora. [Edit:] Though, come to think of it, such an atmosphere would produce a much stronger greenhouse effect. And I doubt it could have that much water vapor without precipitating out. Oh well. Disclaimer: This all assumes that we take the molar mass figure of the atmosphere seriously. We don't necessarily have to, since SE doesn't yet calculate compositions. When it does, this speculation will be unnecessary anyway. maybe oxygen has a smaller presence on the planet? I hope that's the case; I want to to go strellix tanning on a Xeroatl beach! On a more serious note, maybe we can rid the equation of nitrogen, and just leave us with oxygen (with possible nitrogen in amino acids to support our nutritional needs). What kind of atmosphere could we have then? If intelligent life existed there (if it were real), we would need to tell them to excuse our breathing habits. Maybe some bushery and trees around human colonies could stop such problems. On a ore bumorous note, we would just need to carry plants on our shoulder like pirates carry parrots. And there are other factors that could make that planet hostile for human life, for example, the rest of the planets in the solar system, like gas giants (they could protect the planet from asteroids or desestabilize its orbit if they're too close) , asteroids orbits, age, distance to the galaxy core (it's further than the Earth as I can see in the pics), distance to the nebulas and star clusters, distance from pulsars and dying stars, etc. I can find planets with 0.900 ESI or higher with the star browser easily now. You should look at the stats of the 2nd one though.